Austria, Bosnia-Herzegovina, Czech Republic, England, Germany, Ireland, Israel, Liechtenstein, Lithuania, Netherlands, Poland, Slovakia, Slovenia and Wales. Theory: All 30 multiple-choice questions the participants must answer in 10 minutes in their first language. “The German Beekeepers Association D.I.B. is very proud to organize and perform the fourth meeting of young beekeepers”, said president Peter Maske during the greeting of the young participants and their companions in Münster, the college town and city of peace of Westphalia. One year ago the preparation of the meeting always began. Many people were involved, representatives as well from the federal as from the state beekeepers association, but also from the local bee-club. They made a great job. That’s why the 40 young participants and their companions felt fine. 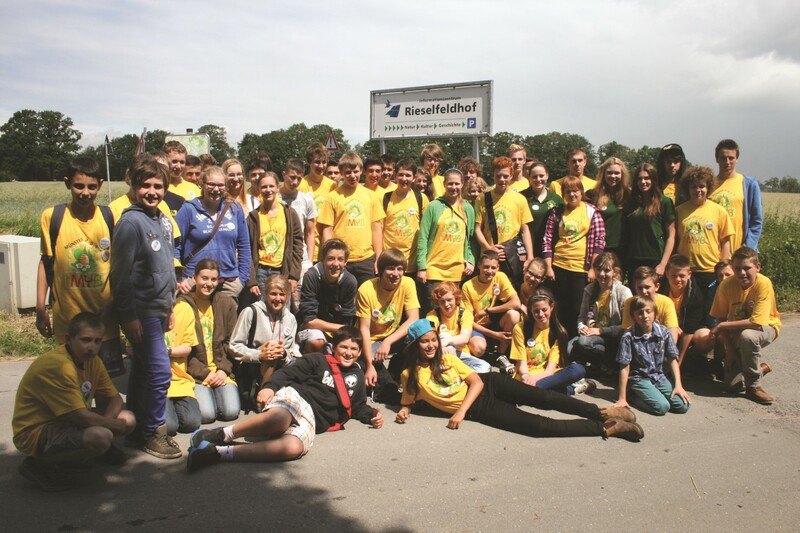 June 20th were planned for the arrival of all delegations in the youth hostel “Gästehaus Aasee” and a later meeting of all on the historic and landmarked monument “Rieselfeldhof”, were the open-air area, seminar rooms and a big tent were prepared for the IMYB. At first it seemed that the god of weather was not on our side. A big thunder-storm moved over Münster and it almost looked as if the meeting that day on the Rieselfeldhof would fall into the water – literally. Despite cancelled trains and flights of the participants, the diligent helpers made it possible for a first meeting to take place in the courtyard in the evening. Dinner was held under the motto “create your own hamburger” – the young people had a lot of fun putting together their hamburger according to their own taste. In addition, the Münster drummers “Bandidas” provided hot rhythms with Brazilian sound and spread a lot of atmosphere. On time at 9 o’clock next morning, the 4th IMYB was officially opened by D.I.B.-president Peter Maske. In addition to the competition, which took place on the entire Friday and Saturday morning, the young people had plenty of opportunities for leisure, play and fun. Aside from this the teams presented their home countries in short presentations on Friday and Saturday evening, which was an interesting and funny time for all participants. Some of the teams were singing, some were dancing and some told interesting stories. In addition, there was a large fire to celebrate the summer solstice, for which the participants made beeswax torches. After the competition, a canoe trip on the Ems River started on Saturday afternoon together with a few companions. For the supervisors it were also interesting days, bercause the organizers had prepared a sightseeing tour, a tour with a water taxi on lake Aasee to Münster-zoo and much more. On Saturday evening it finally happened. The young people were excited to sophisticated, who had probably scored the best results in the competition. D.I.B. kept well this secret until last. In order to give the award presentation a worthy setting, the ceremonial hall of the historic Münster town hall was hired. Many guests arrived for a reception in the foyer of the town hall. The regional association of Westphalian and Lippe beekeepers as well as the D.I.B positioned information walls and distributed free information material, for example small bags with seed of bee plants. A picture presentation showed first impressions of the meeting. Among the attendees were also some honored guests, such as many D. I. B.-officials and association members from Westphalia-Lippe, the mayor of Münster and representatives of the Ministry of Agriculture. The celebration began with the invasion of the teams, led by the flags of the participant-countries. After a few greeting words, the long-awaited award ceremony finally took place. The results were very, very narrow. Team Austria carved out the first place, the german team the second place both in individual and team classification. D. I. B.-president Peter Maske presented all winners with a trophy and a certificate. Also all other participants did not leave the meeting empty-handed. They received a certificate and medal. Everyone was particularly pleased, that the IMYB would continue its tradition and become the host country Poland next year. After the ceremony participants, supervisors and helpers celebrated until late at night in the youth hostel. Their response was consistently positive. Communication media, like newspapers and broadcast, reported about the IMYB at all days, that in Germany remains in positive memory. Photos and more information from the event found here and here.